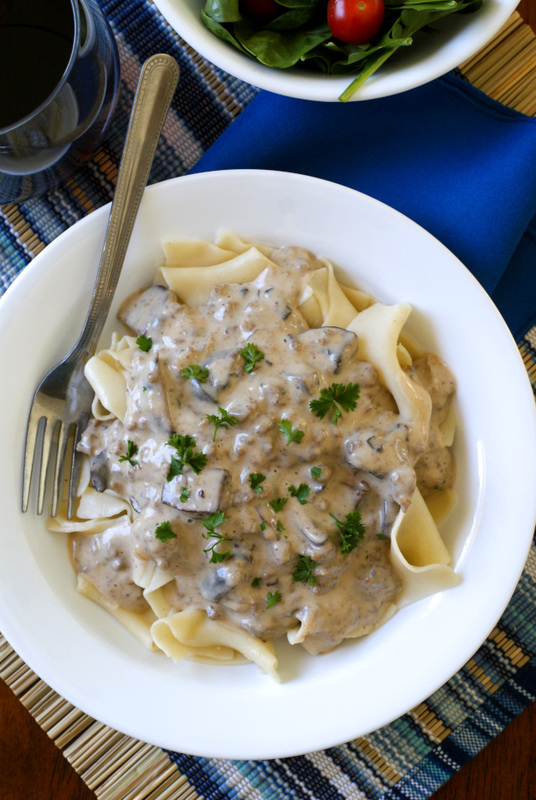 Mushroom Ground Beef Stroganoff is a budget-friendly, easy to make, creamy, comfort food classic that will take the stress out of cooking dinner on a busy weeknight! 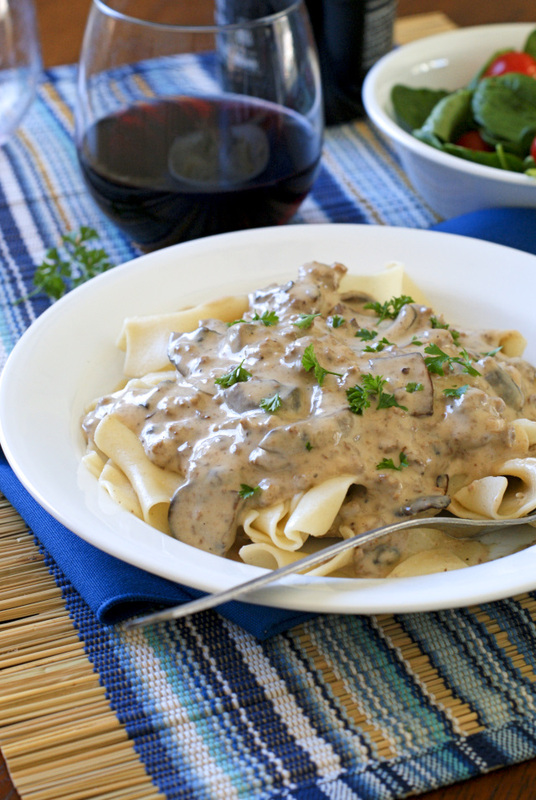 You know, I have to say... stroganoff recipes are the most unappetizing looking meals on the planet. I make a Slow Cooked Beef Stroganoff and this recipe for ground beef style stroganoff and they are both quite unappealing to the eye. The color palette is less than exciting, to say the least, and it really does look like some slop spooned over noodles. But, oh, what delicious slop it is. So very, very delicious, indeed. 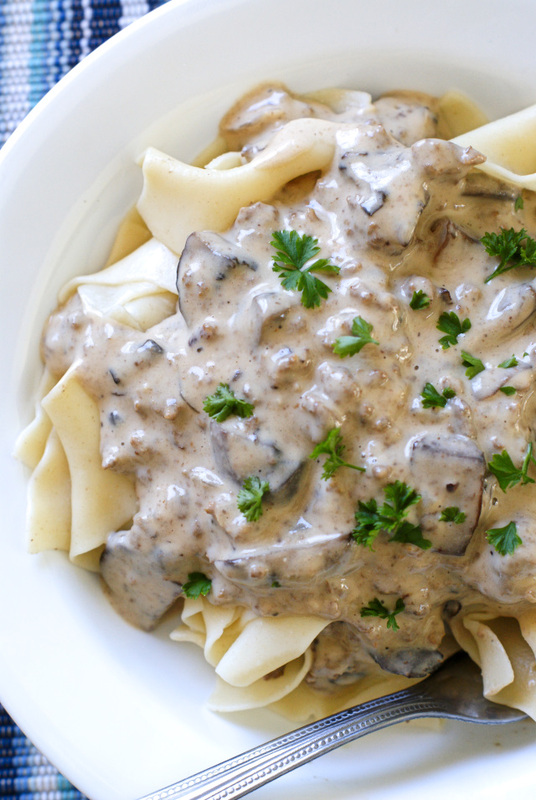 This stove top stroganoff is super economical because it uses ground beef instead of a more expensive cut, but it still has all of the flavor you'd expect from this comfort food classic. It's one of those meals that feels like home, you know? Something moms everywhere and their moms, too, make again and again for their families. I've seen people eliminate the mushrooms in recipes like this one, which is fine if that's your thing. And in the past, I've subbed out all onions in place of them. That was before I had a true appreciation for mushrooms. Now, I would suggest just chopping them up really small as opposed to taking them out altogether. They really make the dish, in my opinion! The extra creaminess is courtesy of the cream cheese and greek yogurt and there's tons of flavor thanks to the sherry and worcestershire. I swear I could almost eat it as a soup! Served alongside a nice garden salad and a glass of red wine and this meal tasted anything but pedestrian, but it's for sure a budget-friendly staple recipe that belongs in everyone's recipe box. It's a favorite with the family and pretty simple to pull together on a busy weeknight! Have you has hamburger stroganoff before? If not, I'm sure you will love it! If you try it, I'd love to know what you think in the comments below! Enjoy! In a large skillet over medium-high heat, brown the ground beef with the onions, garlic, salt and pepper. Drain grease and transfer meat mixture to a bowl. Return the pan to the heat and add the oil. Cook the mushrooms in the hot oil for 5 minutes, stirring frequently until the mushrooms start to brown. Add the sherry to the pan and stir. Stir the meat mixture into the mushrooms and add the cubed cream cheese; stir until melted into the beef mixture. In a large measuring cup, whisk together the beef broth, milk, worcestershire sauce, and flour until there are no lumps. Stir into the beef mixture and simmer for 3-4 minutes until the sauce has thickened. Remove from the heat and stir in the greek yogurt. Serve over cooked egg noodles. Source: Adapted from Mel's Kitchen Cafe.